This is just such a great idea – and can be made small for personal servings or large to accommodate holding eggs or other special breads to serve with your Easter dinner…. and not as hard as you believe. Start by covering a oven safe bowl with two layers of foil. 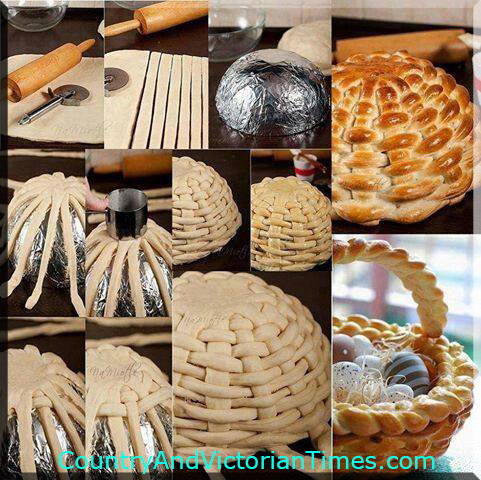 With dough rolled out and cut into strips you will make a basket as shown on the outside of the bowl. Place a braided row at the top. Make an additional braided row for the handle. Bake following instruction for your bread recipe allowing some room to give and take. You can cook regularly or wash the outside of basket with egg wash to give a deep golden color. This entry was posted in Crafts ~ DIY ~ Projects, Recipes, ~Dessert, ~Easter, ~Edible, ~Gifts, ~Holiday, ~Mother's Day, ~Party and tagged Basket, bowl, braid, bread, day, dinner, easter, egg, gift. athering, golden, mother, mother's, roll, wash, ~Party. Bookmark the permalink.